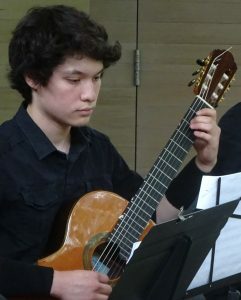 I had the privilege of getting to know Javi, during his senior year, through the McCallum Classical Guitar program. Through a couple of long, non-superficial conversations that are unusual with teenagers, I saw a young man who was a positive force in this world. I didn’t want the good that is Javi to end when his life ended. I wanted it to live on. So, I’ve dedicated my life to doing good in honor of Javi. I’ve started to volunteer with Breakthrough, the organization which was helping Javi realize his dream of graduating from college, and, along with Austin Classical Guitar, I’ve worked to create the Javier Niño Memorial Scholarship, to recognize deserving guitar students who show the same promise as Javi. Javi was a very dear friend to my son, Sandro. He helped him envision what he could accomplish in life and which of his strengths he could use to make the world a better place. Javi had everything going for him. He was a hard-working, smart, fun, polite, kind, generous and handsome young man. A week before his passing, my son told me, “you know I can ask anything to Javi, he always helps me.” He is sorely missed.